Are you tired of spending your hard earned money on tender bedding plants for basket stuffers, only to have them fade in the heat and drought of another long hot summer - Why not make a succulent hanging basket for your porch or patio instead? I’ve made them with tender succulent plants, Echeveria and smaller Aloe, Crassula and others, and also the hardy succulents Sempervivum and Sedum too. The hardy succulents stay outside all year, sometimes needing some tender loving care in the spring, and maybe a dose of worm castings to get them going again. Other than that, they need very little water. The Sedum bloom throughout most of the summer and into the fall, and everything else looks good the rest of the time on benign neglect. Use the wire type baskets that you line with moss or a coco fiber liner, not the solid plastic kind as the succulents you will plant into them need very fast drainage. For soil I use a mix of Sunshine Mix #4 which has extra aggregate for faster draining, or you can use cactus soil mixed with some kind of pumice. Lighter types of soil are best, as when they get water from a heavy rain shower, they can become very weighty. Fill the basket quite full with the soil, as it will settle over time. The number of plants you select will vary with the size of the container, but I over fill them, using lots of different types to make a really full basket; you can always take out any that get too big, and make another one! I aim for about one plant every 10 square cm or 4" or in some cases closer than that, which gives good coverage in your succulent hanging basket. Don’t forget to plant the trailing types near the edge to cascade over. You can even carefully cut holes in the liner and plant into the sides and bottom of the basket for a very full look. 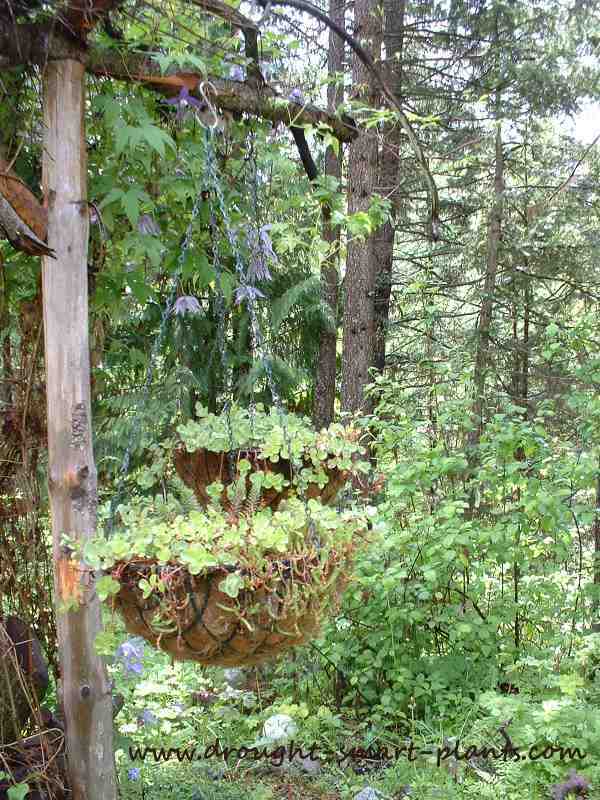 To hang your succulent hanging basket, make doubly sure that it’s secure – use extra strong hooks and chain, and make sure whatever you hang it from can take the weight. Nothing is more guaranteed to make you sad than finding your beautiful succulents in a heap on the deck from a windstorm. For care, stand back and admire, water about once or twice a week until the plants are established, feed occasionally – maybe twice during the season – with worm castings or compost tea, and prune to shape when needed.